Whether she’s walking the red carpet or the streets of Los Angeles, NYC or Paris, we can never get over how stylish the brilliant Larsen Thompson always looks. 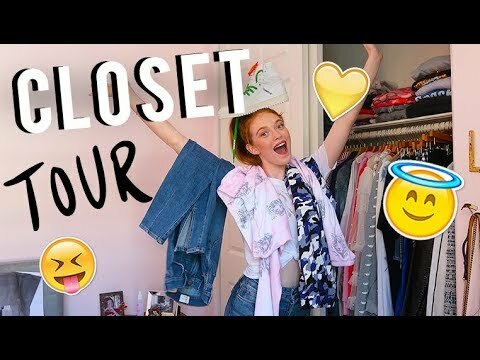 We all want to live in Larsen Thompson’s closet because she has the greatest #OOTDs and we wish we could go shopping with her every day because she has the eye for the best trends. Well, the spectacular model and dancing sensation made everyone’s wish come true by creating a closet tour video. In the exceptional video, Larsen Thompson showcases all of her haute couture and stunning, clothing items – from jackets, to shirts and beyond! We had tons of heart-eye emojis while watching this video because we can’t stop obsessing over all of her clothing items. From modeling to dancing, acting and even making YouTube videos, Larsen Thompson always slays all day, every day. The remarkable Larsen Thompson has been keeping busy with an endless amount of terrific projects. Recently, her modeling campaign with the one and only H&M came out. You can see some of her breathtakingly beautiful pictures below as seen in H&M’s tweets. Strike a #pose like @larsenthompson in our latest denim styles available in-store + online. Larsen Thompson is such a gem and she truly deserves all of her successes! Be sure to watch her latest video on her YouTube channel below and don’t forget to subscribe to her channel to keep updated with all of her videos. Previous Article: Musician Joe Dias Brings Rock Back To This Generation With His New EP, “Rally Cry” — Listen Here! Next Article: Join In On All Of The Fun As Nickelodeon’s “Double Dare” Embarks On A Multi-City Tour Across The U.S. – See The Tour Dates Here!